Robert Michael Moynihan Jr. is an American actor, voice actor, comedian, writer and impressionist, who was a cast member on Saturday Night Live from 2008 until 2017. Moynihan frequently performed with the Derrick Comedy sketch group and appeared in many of their popular internet videos and various projects. He also filmed a supporting role in the group's feature film Mystery Team, which premiered at the Sundance Film Festival in 2009 before a limited theatrical release. In mid-2008, Moynihan had a supporting role in the popular web-series The Line, an online video project funded by Lorne Michaels' production company, directed by SNL head writer Seth Meyers, and starring SNL cast members Bill Hader and Jason Sudeikis. He acted as a sketch regular on Late Night with Conan O'Brien for a number of years and was a contributing writer on MTV's Human Giant, and in years past, he often submitted scripts to SNL with comedy partner Charlie Sanders. Moynihan has also acted in a number of comedy shorts for the website collegehumor.com, including their webseries Every Week on Entourage where he plays "Turtle" from Entourage. During the summer of 2008, Moynihan featured in a national television ad campaign for ESPN Radio with Yankees broadcaster Michael Kay. In the summer of 2009, Moynihan starred in the music video for Colbie Caillat's single, "Fallin' for You". He also appeared in three of The Lonely Island's music videos; Boombox, Shy Ronnie 2 and Threw It On The Ground. He made a guest appearance as the drug-addicted Conrad Bellingham on Mercy. He also appeared in the films The Invention of Lying, When in Rome, and Certainty. Moynihan also voiced the titular character in the FX animated comedy Chozen, which aired for one season in 2014. In 2015, he was a featured character, Lenny, in the romantic comedy film Slow Learners (original title Bad Boys, Crazy Girls). He also voices Panda in an animated Cartoon Network TV show that premiered in 2015 called We Bare Bears, as well as Hal the Dog in an animated PBS Kids TV Show that also debuted that year called Nature Cat. In 2016, Moynihan appeared in a commercial for Pizza Hut's Bacon Stuffed crust pizza, and voiced Mel from The Secret Life of Pets in the same year. Moynihan currently voices the character Louie in the Disney XD revival of DuckTales. Moynihan joined the cast of NBC's Saturday Night Live during its 34th season on September 13, 2008 and left the show after 9 seasons on May 20, 2017 after the end of season 42. Vinny Vedecci Jr, the son of Bill Hader's Italian talk show host, Vinny Vedecci. Wears a black and white child's sailor suit. Always wants to ask celebrities ridiculous questions, but the celebrities cannot understand his broken English, which makes him cry (until Vinny gives his son a cigarette and a drink of wine). Vinny Jr. is based on Johnny Caspar, Jr. (played by Louis Charles Mounicou III) in the Coen brothers' Miller's Crossing. Kirby, an astronaut obsessed with his "little kitty cat". Riblet, Michael Che's high school friend on Weekend Update. Moynihan is an avid reader of comic books, and once invited comics creators Dave Johnson, J. Scott Campbell and Amanda Conner to the same Saturday Night Live after-party to which co-star Taran Killam invited his Illegitimates co-writer Marc Andreyko and members of the IDW Publishing staff, which Andreyko characterized as a "mini-comic con". In August 2016, Moynihan married his longtime girlfriend and Broadway actress Brynn O'Malley. Their daughter was born in July 2017. 2009 The Electric Company Skeleckian Gravity Spray Spokesperson Episode: "Gravity Groove"
Chowder Jam (voice) Episode: "The Grape Worm"
Mercy Conrad Bellingham Episode: "I Believe You Conrad"
2012 Happy Endings Corey Episode: "You Snooze, You Bruise"
Ugly Americans Jerry "The Fire Ant" McMillan (voice) Episode: "Journey to the Center of Twayne"
30 Rock Stewart Derr Episode: "Murphy Brown Lied to Us"
Girls Thadd Episode: "She Did"
Portlandia Robert Episode: "Winter in Portlandia"
2013 Sesame Street Quacker Duck Man Episode: "Porridge Art"
Aqua Teen Hunger Force Zarfonius (voice) Episode: "Storage Zeebles"
Playing House Danny Episode: "Spaghetti and Meatballs"
Drunk History Grover Cleveland Episode: "First Ladies"
2015 The Jack and Triumph Show Mr. Hardgraves Episode: "Siri"
The Simpsons Tyler Boom (voice) Episode: "Cue Detective"
2016 Netflix Presents: The Characters Chuck Episode: "Lauren Lapkus"
2017 Man Seeking Woman Puffala (voice) Episode: "Popcorn"
2018 Bob's Burgers Sam (voice) Episode: "Are You There Bob? It's Me, Birthday"
Detroiters Himself (As "Fat Bieber") Episode: "Lois"
^ Andreeva, Nellie (May 17, 2017). "Bobby Moynihan Leaving 'Saturday Night Live' After 9 Seasons". Deadline. Retrieved May 17, 2017. ^ "Michael Kay and SNL's Bobby Moynihan "Sizzling Bacon" ESPN Radio Commercial". YouTube. 2009-01-19. Retrieved 2013-06-17. ^ "Michael Kay and SNL's Bobby Moynihan "Brobot" ESPN Radio Commercial". YouTube. 2009-01-20. Retrieved 2013-06-17. ^ Petski, Denise (2016-12-16). "'DuckTales': David Tennant, Danny Pudi, Ben Schwartz Among Voice Cast For Disney XD Reboot". Deadline.com. Retrieved 2017-03-14. ^ Dietsch, T.J. (October 17, 2013). "NYCC: 'Saturday Night Live's' Taran Killam Debriefs 'The Illegitimates'". Comic Book Resources. 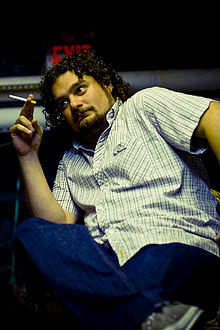 ^ "Thinking Bobby Moynihan is Not Married? Well, Think Again! He's Already Exchanged Vows with his Wife!". Liverampup.com. 2016-12-20. Retrieved 2017-03-14. ^ "Bobby Moynihan and Wife Brynn Welcome Daughter". PEOPLE.com. Retrieved 20 November 2017. This page was last edited on 15 April 2019, at 02:04 (UTC).